Right then, day 2 of Vegan MoFo – bring it on. My husband and I generally try to start the week healthily. (We do eat healthily a lot of the time but we’re not health-nuts. I like cake too much!) It seems to be a lot easier to make a healthy meal at the start of the week before you’ve had a few days at work; before things have had time to go wrong; before you just plain old can’t be arsed. Seeing as I’m starting the week on a healthy note, I thought I might as well start this first one with some food that is probably what people imagine to be stereotypically vegan – brown rice, steamed veggies and beans. However, I’ll be showing you that these ingredients don’t have to be boring! Especially when paired up with a lovely rich miso sauce. Yum yum yum. 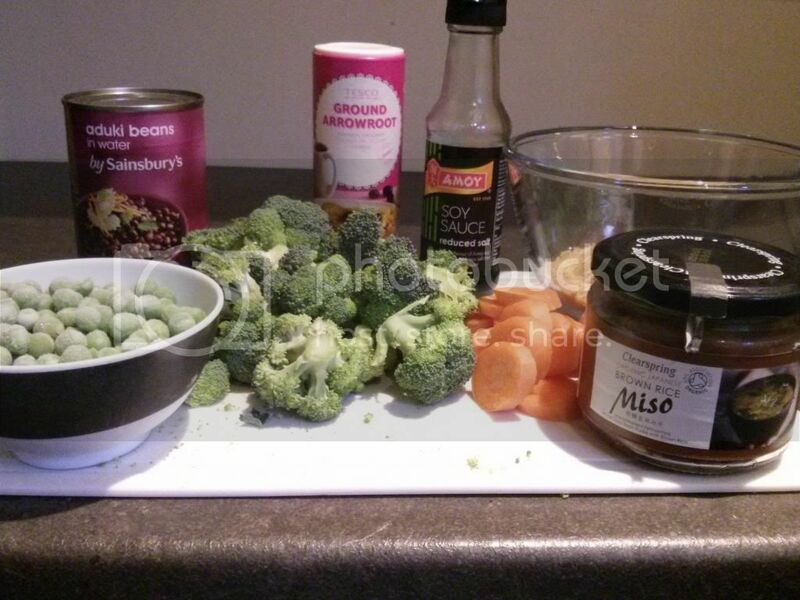 But first of all, let’s have a look at why this is a healthy dish. Brown rice – Only the outermost layer (the hull) of the rice is removed to produce brown rice, leaving many nutrients in tact (compared to white rice where the milling process destroys up to 90% of some nutrients!). Brown rice is high in manganese (helps to produce energy), selenium (reduces the risk of colon cancer), magnesium (lowers the risk of type-2 diabetes) and fibre (essential for a healthy digestive system). Steamed veggies – Steaming helps to retain more of the nutrients in the vegetables than boiling, where the nutrients can seep out into the surrounding water. It also helps them to stay nice and crunchy rather than school-dinner reminiscent mushy veg! Beans – Beans are generally low in fat (except soy beans) and offer complex carbohydrates, dietary fibre, and essential fatty acids. When combined with grains (such as brown rice), they form complete proteins, which is said to be good for people that don’t eat meat (please note – I have read some controversy surrounding whether it is necessary to eat “complete proteins” or if you still get the same nourishment if eaten separately, however I’m not going to go into this today!). Miso – Miso is a fermented product, made from rice, barley, and/or soybeans, which comes in a thick paste and is then watered down during cooking. Today I will be using brown rice miso but it comes in many varieties. Miso is said to be high in vitamin B12 (although this has been contradicted in some studies). Miso is high in a number of nutrients, including vitamin K, protein, and fibre. Enough learning! To the food! Cook the rice to packet instructions, steaming the broccoli and carrot over the rice pan. Add the peas to the rice in the last five minutes. Meanwhile, make the sauce. In a small pan, combine 1 tbsp miso with 1 tsp soy sauce and 1 tsp lime juice (not pictured for some reason). Mix 1.5 tsp arrowroot powder with 1 tbsp cold water and add to the miso. Stir to combine. Add enough hot water to make a sauce and heat, stirring until thick. Add more water if needed. Cook beans briefly until warm. 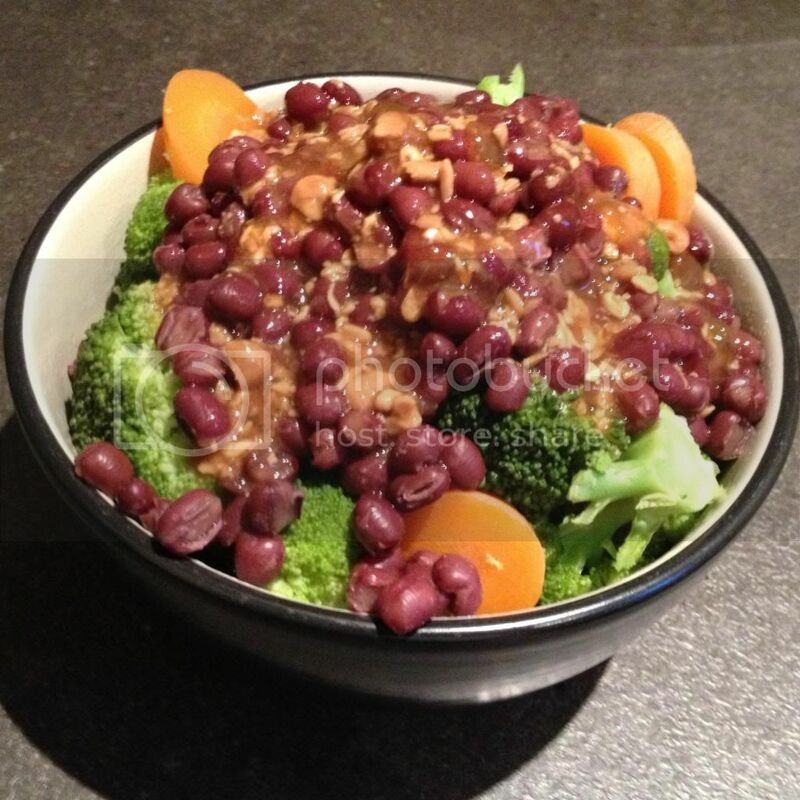 Put rice and peas into a bowl, top with veggies and beans and smother with sauce. Voila! That looks like a super delicious healthy meal! Yum!